We are determined to provide a classy range of Upholstered Chair. The raw material like natural & recycled wood and others used in the fabrication of these chairs. Available in a range of designs, colors and sizes to meet individual requirement of clients, our offered chairs are ideal for domestic and commercial sectors. Keeping the diverse requirements of the customers in mind, our company is instrumental in presenting supreme quality range of Upholstered Chairs. 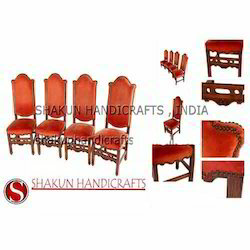 These Upholstered Chairs are widely demanded in different homes, offices and hotels. Our product range is made according to the client’s demands and by using quality material. Competent to accent any room furnishing, these wood upholstered chairs feature oval shaped designer back, curved legs and padded dome seat covered with high quality fabric. To bring a new whiff in the interior decor, these wooden upholstered chairs are perfect buying option. 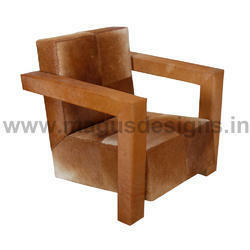 Keeping the track of latest happening of this domain, we present our customers with the superior quality of Bar Chair. Chesterfield Chair offered can be offered in other numerous designs, patterns as demanded. We are offering an optimum quality assortment of Wing Chair which is available in various sizes. With our attractive designed chairs, we have maintained broad clientele. With our expertise and trustworthiness, we are engaged in offering an optimum quality range of Bar Chair. Offered Designer Bar Chair is precisely designed making use of advanced methods and tools that give fine finish and high strength to it. Goel Decors India Pvt. Ltd.